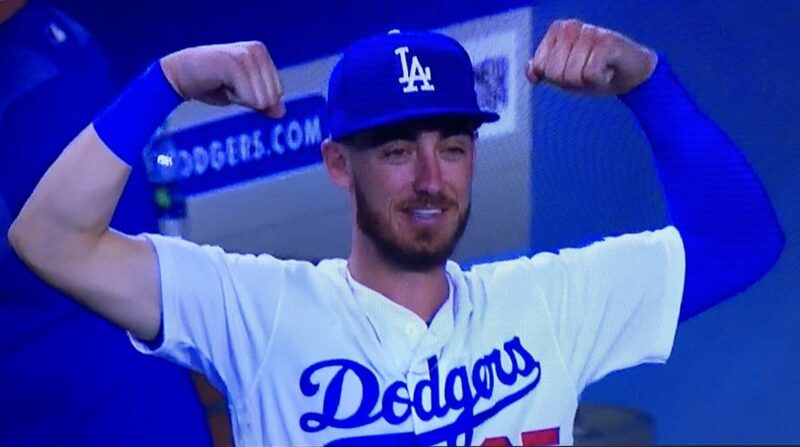 Dodgers 18, D-backs 5: Scoring an unGodley amount of runs vs. guys named Zack is now their M.O. The weirdness of Friday night’s marathon game continued right into Saturday’s matchup between the Dodgers and D-backs. Do you want dongs-a-plenty, two position players pitching, and all this in a little over three hours? Then this was the game for you. Kenta Maeda‘s season debut started off shaky. Jarrod Dyson hit a rare home run, a leadoff shot to right center field against the veteran right-hander. Dyson hit only two home runs in 237 plate appearances last year. Joc Pederson immediately responded with a solo opposite field dong off Zack Godley in the bottom half of the first. Pederson has already slugged three home runs in his first three games. I’m glad they didn’t traded him for marginal prospects this offseason. Pederson also made a great catch in left field near the wall and drew a key walk to load the bases off Godley in the bottom of the third. Speaking of, the third inning was very costly for the D-backs. Godley made a big error, throwing the ball wide of first on a Maeda sacrifice. Austin Barnes, who led off the frame with a single, was caught in a force out at the plate. Seager tapped the ball in front of the plate, and Godley shoveled it to catcher Alex Avila to get Barnes on the slide. The Dodgers challenged the call, but it was upheld. If small ball doesn’t work, good ol’ fashion base hits will work well too. Justin Turner seems to be heating up, and he smacked a two-run single to break the tie. Then Cody Bellinger followed with a RBI single of his own, and A.J. Pollock finished off the triplet attack with a RBI single. The Dodgers were up 5-1 just like that, scoring four runs in the frame. Arizona got one back when Avila homered in the top of the fifth, but the Dodgers’ offense would pour it on in the sixth. First, we’re treated to the second #Belli of the year. Godley was still in the game even though he was wild and didn’t have his best stuff because both teams used a combined 15 pitchers in Friday’s game. Torey Lovullo was hoping for some length out of him. But the Snakes unraveled some more, and Godley was chased from the game after he hit Taylor with a pitch followed by a Maeda double. Reliever Matt Koch also looked wild, and he hit Pederson with a pitch to load the bases with one out. Seager singled, allowing Barnesy to score. Turner walked, and Bellinger then proceeded to cash in two more runs on a single. Bellinger tried to challenge Dyson’s arm, and stretch his base hit into a double, but was thrown out. Yet another Dodger was hit with a pitch following that, this time Pollock took his turn. Then Max Muncy got in on the action to drive in L.A.’s fifth run of the inning and 11th run of the game with an RBI single. Godley’s final line: 5.1 IP, 8 R (7 earned), 8 H, 3 K, 2 BB, 101 pitches (63 strikes). Maeda became the first Dodger starter to pitch into the seventh inning this year. Unfortunately, Adam Jones took advantage with a solo homer off him. Despite the three solo homers he allowed, Maeda ate some innings and kept the D-backs’ batters at bay for most of the night. His final line: 3 R, 5 H, 6 K, 2 BB, 106 pitches (68 strikes). He threw nearly as many changeups (39) as fastballs (44). Maeda earned a standing ovation on his way back to the dugout after 6.2 innings. In the bottom of the seventh, the D-backs officially threw in the towel. Position player pitching alert: John Ryan Murphy, a catcher, took the hill for Arizona. The Dodgers didn’t take full advantage right away, but Pederson and Turner both smacked singles off Murphy’s 58-mph lob. Bellinger had the opportunity to collect another four RBIs with the bases loaded, but he flew out to end the frame. David Peralta went deep against Brock Stewart in the top of the eighth to make it 11-5, but Murphy was back in for the home half of the eighth, and the Dodgers gladly accepted. Let the batting practice commence! Barnes hit a two-run dong. Stewart got in on the action with a double. Alex Verdugo hit a RBI double. Bellinger homered for the second time of the night. He drove in a career-high six runs. We never got to see Yasiel Puig pitch, nor have we got to see Enrique Hernandez catch, but we got Russell Martin pitching a 1-2-3 ninth to close it out for the Dodgers. I was going to post the Walker Buehler puppy footage as the entirety of the recap if they had lost. Who am I kidding? I was going to post it win or lose. The Dodgers improve to 2-1 and go for their first series win when the Opening Series concludes on Sunday afternoon. Buehler makes his season debut, and Luke Weaver makes his D-backs debut. First pitch is set for 1:10 PM PST/4:10 PM EST.